Located in Heyburn, just northeast of Burley, the Mini-Cassia Chamber of Commerce and Visitor Center is your one-stop shop for information about some of Southern Idaho’s most popular and scenic attractions. Stop in and see us! 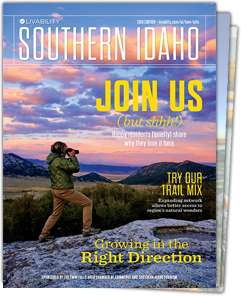 We’d love to help you plan your next Southern Idaho adventure. Small Cities, Big History. Heyburn, where the Mini-Cassia Chamber of Commerce and Visitor Center resides, is one of 12 cities in the region that trace their beginnings back to the turn of the 20th century. Each charming city is a gateway to the area’s beautiful countryside, offering easy access to attractions like the Snake River, City of Rocks Scenic Byway, Lake Cleveland, Pomerelle Mountain Resort, and hundreds of fishing spots and hiking trails. Super Snowpack. Pomerelle Mountain Resort offers excitement for both novice and experienced skiers, with 22 runs, two terrain parks, and a vertical drop of 1,000 feet. Snowmobiling and tubing are available, too — and every activity comes with a jaw-dropping view of the Magic Valley. But you don’t have to wait for winter: Pomerelle is open on weekends from July 4 through Labor Day for hikers and sightseers. Gorgeous Lakes. Make Lake Walcott State Park and National Wildlife Refuge your go-to weekend getaway, with beautifully maintained camping, fishing, and picnic areas. If you prefer areas that are a bit more untamed, try Lake Cleveland, a crater lake surrounded by flowers, or the remote and wild Independence Lakes. Local Specialties and Comfortable Beds. Our restaurants range from tasty American fare to Mexican favorites. When you’re ready to turn in after your adventure, check in to one of our local hotels for a quiet night’s sleep.